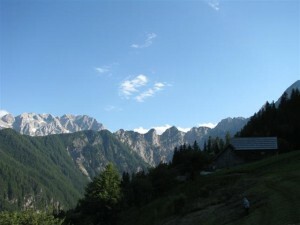 Our home is located in the Kamnik-Savinja Alps in a small, hidden valley Matkov kot. It is surrounded by a mountain range consisting of Matkov Grintovec, Matkova Kopa Mrzla Gora, Hude dane, Hudi prask, Matkovo okno, Savinjek to Veliki vrh, which separates Matkov kot from the valley Logarska dolina. The estate extends from 900 to 2203 metres above the sea level, the height of the Mrzla gora mountain. Our home lies at the height of 1165 metres. The name of our farm is old, as are the names of most of the farms in Solčava. Our aim is to produce a healthy food and at the same time not to harm nature. 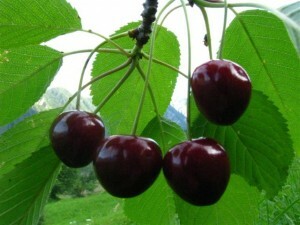 We farm along the eco lines and have been a registrated eco farm for several years. We grow autochthon and traditional Slovenian animal breeds, like cows called cika, a breed of sheep which we are extremely proud of as it originates in our region and thus it is called jezersko-solčavska ovca, a kranjska sivka bee, štajerska hen, pigs, horses, donkeys, goats and many more. In short, on our pastures you can find a variety of different animals. Maybe you haven’t heard of the fact that the family used to be everybody who lived on a farm: family members, workers and also animals. Cultivating pastures and forests is a time-consuming work because there is a lot of handiwork. A cattle breeding is not very profitable, but we insist on it as we keep our land as we received it from our ancestors, we love it that way, and visitors admire it. Wood from our forests is of extreme quality due to the high altitude. We cut it mainly in the winter when the wood rests and does not grow. Minor quantities of wood for special consignees are cut on a particular date, according to the moon calendar. If our clients wish, we also saw and dry-cure the wood. 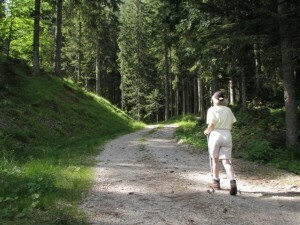 There are plenty of activities to do in our forests, like cycling on the roads or hiking on the paths. It is healthy for your soul and body. There are many birds and wild animals in the woods you can listen to or watch in their natural habitat.